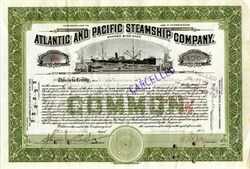 Beautifully engraved certificate from the Atlantic and Pacific Steamship Company issued no later than 1916. This historic document was printed by Hamilton Banknote Company and has an ornate border around it with a vignette of a steamship. This item has the signatures of the Company's President, Joseph. P. Grace and Secretary, J. Louis Schaefer and is over 101 years old. Stamped, punched and pen cancelled. Joseph Peter Grace was born in 1872 and died in 1950. He was the son of William Russell Grace who was the founder of W. R. Grace & Co. He was president of W. R. Grace & Co. from 1907 to 1945. He was also the president of the Atlantic and Pacific Steamship Company. The Atlantic and Pacific Steamship Company was controlled by the W. R. Grace & Co. The Atlantic and Pacific Steamship Company owned four steamships Santa Clara, Santa Olivia, Santa Cruz and the Malta. W. R. Grace and Co. was founded in Peru in the mid-19th century to engage in the guano trade. William R. Grace relocated to New York in 1866. What later became the Grace Line originated in 1882 as a line of sailing vessels between Peru and New York. Grace established regular steamship service in 1893 with a subsidiary called the New York & Pacific Steamship Co., operating under the British flag because ships built outside the United States were banned from US registry until 1905. US-flag service began in 1912 with the Atlantic and Pacific Steamship Company. The activities of both companies and the parent firm were consolidated into the Grace Steamship Company beginning in 1916. The firm originally specialized in traffic to the west coast of South America; then expanded into the Caribbean. After World War II, the company gradually withdrew from holdings in Latin America and finally abandoned the shipping business altogether to concentrate on chemicals in 1969. It is still in business, but not as a shipping concern. At its peak, the Grace Line was a major force in American merchant shipping. Shortly after World War II it owned 23 ships totalling 188,000 gross tons, plus 14 more on bareboat charters. The Grace Line flag was red with the word "GRACE" in blue on a white lozenge. Sources: Wedge (1926), National Geographic (1934) (showing letters with serifs), Talbot-Booth (1937), US Navy's 1961 H.O.